Early bird registration for SPI annual and supporting members takes place on April 3rd only beginning at 9:30am-6:00 pm and will allow early registration for one camp per child. Regular Registration begins on April 5. To register your child fill out the easy pre-registration form that will be available and make an online payment. Your order will be fulfilled/processed when we have confirmed eligibility and placement. You will then be required to fill out more detailed information about your child. More detailed information is available below the chart. We hope to provide additional camps later in April. Half-day camps will be from 8:30am-11:30am this year, earlier than last year. All camps are nature-play camps. Children will play in the river, creek, meadow, and pine forest. They will get wet and dirty and do all the things you wish kids these days still did outside - like climbing, running, catching frogs in the ponds, and playing in the river, even in the rain, without electronic devices. They will gain confidence, learn how to take risks safely, and improve their social skills in a natural environment, gaining experience, knowledge, and appreciation of our natural world. All instructors are elementary school teachers. July 9-12: Family Camp, 8:30am - 11:30am, for children ages 5-11 (includes all children starting kindergarten) so that siblings can be together. Camps will be held upstairs at the Wright Center or Columbia School and will be instructed by Eric Vanderhoof, science teacher at Mount Vernon High School. Make your own apps! Android programs respond to screen touch, GPS, acceleration, and sound. Create games, art programs, life organizers, and more. No programming experience needed. For older students, advanced code camp challenges students to develop apps that interact with the real world using raspberry pi computers. Perfect for students with some coding experience. Kids love robots. Kids love legos. Lego robotics camp takes this love and channels it into a series of projects that introduce students to the engineering process (and helps them make really awesome robots to do their bidding). There will be both guided and free-build time using the lego NXT robotics system. Robot programming is done using an easy drag and drop interface. Levers, gears, pulleys, and wheels. Simple machines are the basis for any budding engineer’s inventions. Use legos to explore how simple machines make our technology possible and our lives better. Each camp day includes a focus on a different simple machine, followed by an opportunity for creative free building. Chemistry is the art and science of transforming one material in into another and of understanding the nature of the physical world. To emphasize that this happens in the real world outside a lab, real world chemistry will entirely use materials that can be found or bought in Mount Vernon stores. Students will extract and purify plant products, examine the interaction of light with matter, transform metals, and use solar power from grocery store purchases. No prior chemistry experience is necessary. Physics in Motion helps late elementary students understand motion in the world around them. By building roller coasters, rockets, fan cars, slingshots, spinning tops and hovercraft students will gain an understanding of mechanical energy and momentum. No prior physics experience needed. Students will take home their creations. Electricity powers the modern world. Electrical physics develops students’ concepts of electricity, first by zapping using static electricity, then by making electricity follow circuits through lights and motors, and finally by building basic electronics. Several projects will be taken home. We understand the world mostly through sound and light. This camp aims to help students learn to use and change the waves in the world around them. By using speakers, lasers, mirrors, lenses, and slinkies, we hope to really understand how musical instruments, surround sound, headlights, 3-D goggles, cameras, and microscopes bend vibrations in the world around us to our will. Several projects will be taken home. Tentative: @ the Wright Center with Kenyon College's Film Department, grades 7-10. 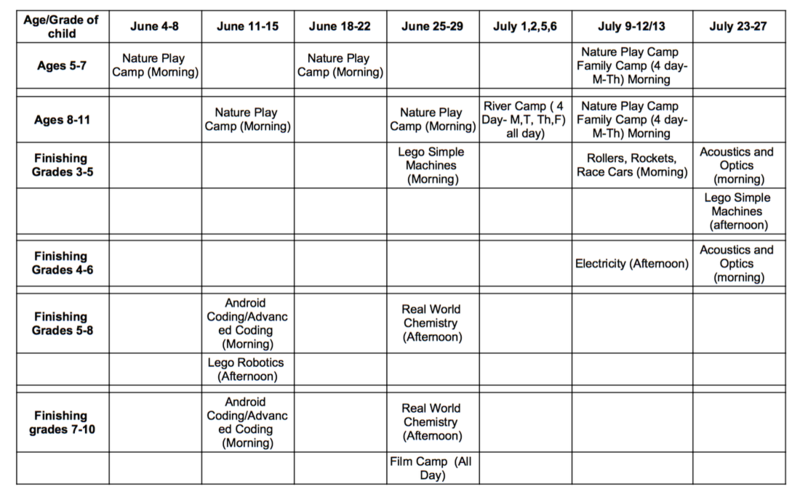 Full-day, June 25-29.